Transmission technology has advanced considerably over recent years. Understanding the latest technologies and sourcing the right quality mechanical power transmission product is vital in ensuring the optimum performance and trouble-free operation of production equipment. In short, inferior product quality prevents peak mechanical performance. Mechanical power transmission products are the heart of a machine. They keep operations running and productivity on track. However, if there is a potential problem with the equipment this will be reflected in overall output. Issues that can impact on mechanical power transmission include misalignment, unbalance, lubrication and looseness or tension. If any of these are encountered there will be problems with performance and operations will be interrupted, leading to costly downtime and expensive repair or maintenance outlay. Maintaining production line integrity is essential and avoiding any financial impact of downtime resulting from breakdowns is paramount. That's why experts in this sector advocate sourcing the right quality mechanical power transmission products from an authorised distributor, to reap long-term benefits. By working in partnership with an authorised distributor, manufacturers can be certain they are using the right quality mechanical transmission products. They can benefit from reduced downtime, extended time between planned maintenance programmes, improved performance and output, reduced energy consumption and extended product service life. There are a whole range of key benefits, including quality assurance and traceability. The warranty and traceability of all products supplied is guaranteed. Quality assurance, consistent part numbering, total product traceability and a full manufacturer’s warranty far outweighs any short-term purchase savings. Technical innovation is another benefit. Manufacturers can be confident that the latest technical innovations, design and specification is being utilised - minimising the risk of reworked, second-hand, poor quality components from alternative sources. With the latest products and materials there’s greater resistance to wear, reduced vibration and noise levels plus lower energy consumption. Product repairs or replacements can be sourced quickly from a trusted supplier with an extensive stock holding, preventing costly downtime or waiting for parts to arrive to get production back on track. Using quality parts also leads to less downtime, repair and replacement costs are reduced and overall output is increased. For any issues, manufacturers can tap into a wealth of technical expertise and exceptional product knowledge at all times from a trained team of experienced professionals. There’s access to technical support and advice from manufacturers directly if needed, plus specific requirements can be discussed for customised mechanical power transmission products to support operations. Manufacturers are constantly striving to innovate and tackle the challenges of misalignment, unbalance, lubrication and looseness or tension in mechanical power transmission. The latest ‘added value’ products for premium suppliers include the service-free and energy-efficient Quad-Power 4 Gates V-belt and the Tsubaki Lambda lube-free chain, as well as the Optibelt Red Power 3 maintenance-free belt, Renold Sovereign wear-resistant chain and the Timken Quick-Flex couplings. The Gates Quad-Power 4 V-belt is designed to offer a way to cut back on belt replacements and deliver a higher performance. It is the first bandless zero-maintenance V-belt. Its new generation EPDM rubber compound makes for a long service life and a wear-resistant belt under extreme temperatures, -50°C to 130°C. It features minimal-elongation polyester tensile cords for stable tension over the entire lifetime. It also has a blue adhesion layer for an extra strong bonding of the tensile cords and the rubber compound. It is service free, withstands a broad temperature range, is energy efficient and all lengths and sections of the range meet Gates UNISET tolerances, meaning that no matching is required. 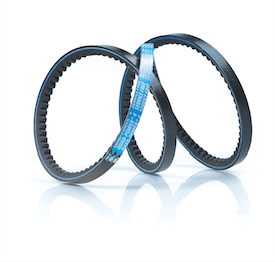 Meanwhile, the next generation of Red Power 3 V-belts from Optibelt offer up to 50% more performance, while at the same time cut costs by up to 35%. Providing a maintenance-free option, the V-belt maintains optimum tension throughout its service life and has an increased temperature range from -40°C to 100°C, as well as increased life due to dual wrap. It is also shock resistant and energy efficient. Tsubaki's Lambda chains were the first in the industry to use a special oil-impregnated bush, making them ‘lube-free’. The company’s latest innovation, the BS Lambda chain, can be disassembled quickly and safely without damaging the bushes and has outstanding performance in temperatures up to 150°C. Benefits include cost savings on maintenance, reduced labour costs and overall purchasing cost savings due to its overall lifetime value and lower frequency of replacements. The new Renold Sovereign chain includes a surface treatment that greatly increases wear resistance, making it suitable for aggregates, agriculture and construction. It is ideal for restricted maintenance situations and suitable for high speed or heavy load applications. Offering resilient and durable components, its lifetime wear is up to four times longer than lower quality chains in harsh environments, providing excellent reliability and contributing to reduced maintenance costs. Designed for high and low torques as well as variable speeds, Timken Quick-Flex couplings have the strength to handle tough challenges with little or no maintenance. Easy-to-install and requiring no lubrication, their lifespans match those of rotating equipment to help keep the overall cost of ownership low. They offer efficiency, through the easy replacement of urethane inserts without the need of removing the hubs and durability, as the design can eliminate the interference between coupling hubs and is able to withstand up to two degrees of misalignment. Simona Lendelova is product manager - Mechanical Power Transmission at Brammer.